In the past, the term geothermal energy was used to describe high temperature resources extracted from deep, subterranean reservoirs. The definition has since been broadened to encompass low temperature geothermal resources as well. Low-Temperature Geothermal (Low-T) refers to energy resources derived from the earth's shallow subsurface, i.e., at temperatures below 149°C (300°F). High temperature geothermal resources exhibit temperatures above 149°C, and are typically found in areas of high tectonic activity, like volcanic belts. The word geothermal simply means earth-derived heat. Temperature increases with depth within the earth's crust due to the heat generated from both primordial heat (generated when the earth was created) and radioactive decay; this is referred to as the geothermal gradient (on average about 2.5-3°C/100m). Low-T offers a range of low-intensity applications including use in spas, direct space heating and cooling systems, in aquaculture, agricultural drying, snow melting (particularly in Iceland), and low wattage power generation. Geothermal resources have been identified in over 90 countries and there are records of geothermal utilization in over 72 of them. Data from Natural Resources Canada and the U.S. Department of Energy and the Environmental Protection Agency, show that if just 100,000 homes swapped conventional heating and cooling systems for geoexchange, Canada could reduce its CO2 emissions by 400,000 tonnes – the equivalent of planting more than 90 million trees. Lately, new technologies have expanded Low-T's traditional services of household heating and cooling. Use of Low-temperature geothermal for power generation has gained popularity in recent years as the geothermal family's more accessible sibling, residing closer to the surface than high-temperature reservoirs, and tappable almost anywhere underfoot because it relies on the natural geothermal gradient. Low-T power comes at a significant downside however, with equipment costing more and overall efficiency providing a smaller profit compared to high-temperature powered generation. Canadians use low-T to maintain comfortable temperatures indoors year-round with Geoexchange systems. As for power generation? Like high-temperature geothermal, low-temperature is not used for power generation anywhere in Canada, though the potential is there should the country decide to move toward it. Low-Temperature Geothermal, Low-T Power, Groundsource, Geoexchange, Heat Pump, Heat Exchanger - What's what in Low-temperature Geothermal? Low-temperature Geothermal: Low-temperature geothermal projects are defined as projects that use water temperatures of up to 149°C (300°F) to provide heating and cooling, or to produce power in output capacities of just a few megawatts. Groundsource and GeoExchange Systems: Geoexchange and Groundsource mean the same thing. They both refer to a central heating and cooling system that pumps heat to or from the ground. This is a type of low-temperature geothermal project. 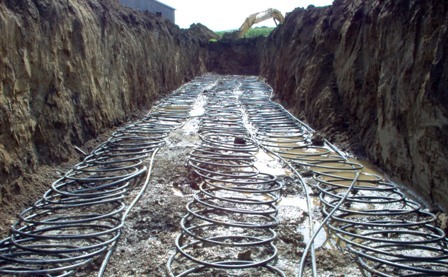 Heat Pump: Groundsource and Geoexchange systems use a heat pump to force the transfer of heat above and below ground. Heat Exchanger: These are used in high-temperature and low-temperature applications to transfer heat from one medium to another. In Low-T Geoexchange systems, they are built into the Heat Pump. Low-Temperature Geothermal Power: The use of geothermal resources below 149°C (300 °F) to generate electricity, usually through the use of a secondary fluid. Canadian Geothermal Energy Association (CanGEA). ‘What is Geothermal?’ CanGEA. Accessed May 30, 2012. http://www.cangea.ca/what-is-geothermal/. Artist's depiction of a home geoexchange system. Groundsource or geoexchange systems use stored solar heat and/or the earth’s heat as it is stored in the ground and in bodies of water like oceans, lakes and ponds. These systems account for around half of all geothermal use. Generally, the earth’s surface under the frost line maintains a nearly constant temperature between 10 and 16°C. Temperatures below and above ground shift back and forth with the seasons. In winter, ground temperatures are warmer than the air above them, while in summer, temperatures are cooler under rather than over. These temperature differences are the key to geoexchange systems. 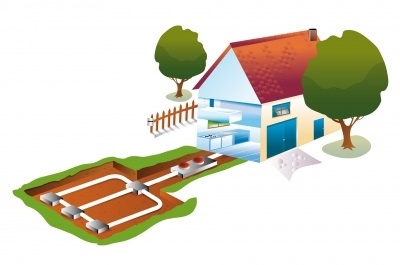 In geoexchange systems, a heat pump is used to transfer heat stored in the earth to buildings in the winter, and out of them during the summer. In this way, the earth acts as a heat source in the winter, and a heat sink in the summer. 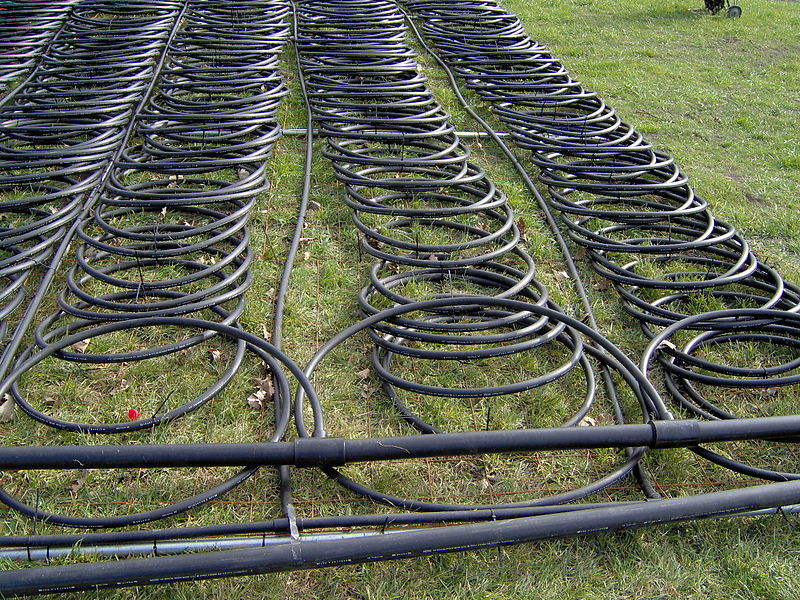 The series of pipes form a "loop" that circulates fluid (either water, or a mixture of water and antifreeze) that absorbs heat from or releases heat to the ground. Pipes are buried beneath the ground where warm temperatures are of use in the winter, and cool ones in the summer. The loop is constructed of polyethylene piping buried in the ground, or alternatively submerged in a nearby lake or pond (lake loop/ pond loop). The heat transfer liquid is circulated along the loop. The liquid absorbs heat as it circulates through the ground, and delivers it to the heat pump, which extracts that warmth and disperses it throughout the home. The cooled liquid is then recirculated around the loop over and over again. This is often described as a closed loop system. A different way to run a geoexchange system, is to directly pump ground or well water through the heat pump. This eliminates the need for a heat transfer liquid, relying instead on an existing water supply. This is often described as an open loop system, as new water is being used, even though used liquid is returned to the ground. These systems can be problematic if the well water has a high mineral content, resulting in potential scale build-up and rusting over time. Both systems extract heat from the liquid that gets circulated through the piping, but what then? The heat can be distributed throughout the building using air or water. 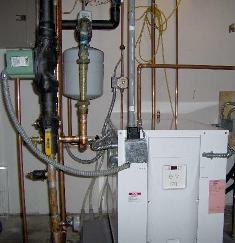 Forced-Air Systems are the most widely used in Canada, but hot-water or hydronic systems can be found as well. In a Forced-Air System, heat from the piped liquid is transferred to air that is blown over it. This heat transfer is accomplished with the use of heat exchangers that move heat from one medium to another. The warmed air is then guided through ducts to all areas of the house (the same way Forced-Air fossil fuel or electric furnaces would operate). In Hydronic systems, the heat exchanger transfers heat from the piped liquid to liquid contained in a hot water distribution system. Some types of equipment that can be used to disperse heat within this system include hot water baseboard radiators and radiant floors. The former are the most used, however, radiant floors are emerging as a popular choice for their comfort and efficiency. A liquid to water heat pump. To help explain the concept of “recharging”, the Canadian Geoexchange Coalition suggests thinking of the geoexchange earth loop as a rechargeable battery, permanently connected to a battery charger (heat energy contained in the ground). If the loop is repeatedly drawn upon at a rate quicker than it can recharge (reheat) itself, then the system will be unable to run properly. Unfortunately, there is no simple way to recharge it quickly. The larger the loop, the less of an issue recharging becomes. Thus, it is important to closely predict a building’s energy demand, and install an appropriately sized loop. Where can Geoexchange be used? Geoexchange is viable almost everywhere. A series of pipes are buried underground near the building they are heating/cooling. This may require the removal of trees and shrubs to properly install the system. Usually, where space allows, pipes are buried horizontally in trenches four to six feet underground. If space is limited, pipes can be implanted vertically into the ground by drilling to a maximum of about 300ft. If the ground is quite rocky, this method may not be an option. Once the pipes are buried, the surface can be reclaimed as before. 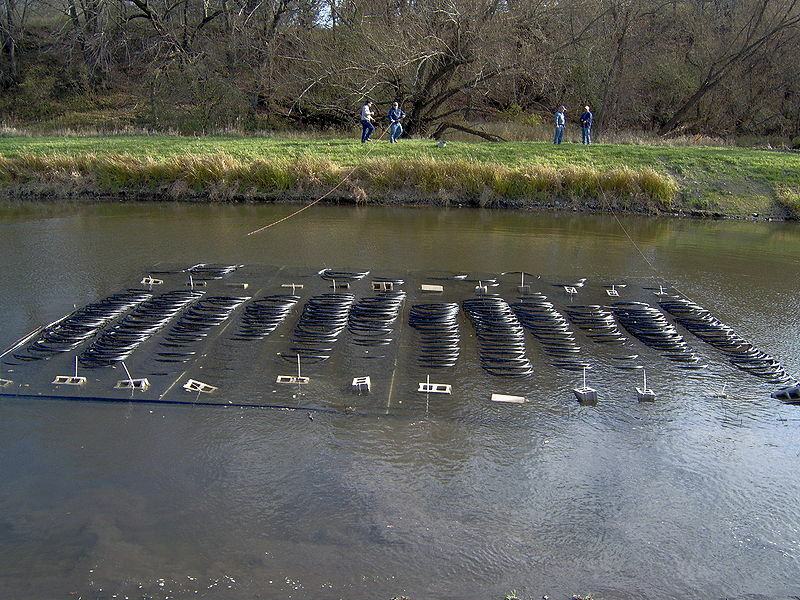 Here is an assembly of Geoexchange tubes, ready to be sunk to the bottom of a pond where warm temperatures are of use in the winter, and cool ones in the summer. Geoexchange systems range from small backyard systems, to large systems for businesses and institutions. The West Vancouver Community Centre, for instance, relies largely on a geoexchange heating and cooling system to regulate the air within its facilities, as well as the water in its aquatic centre. Geoexchange is also becoming popular in schools across the province. Bodies of water including ponds and lakes also offer the potential for a GeoExchange system that naturally provides the fluid needed to provide the heat differential. If a body of water is being incorporated into the system, the pipes are submerged in the water body. Here's the same geoexchange system being sunk to the bottom of a pond. Global interest in geoexchange technology is gradually increasing, with the majority of recent growth in the United States, Japan, and Europe. The total number of geoexchange systems installed throughout the world stood at 1.3 million in 2005, which represents almost double the number of units installed in 2000. Iceland, the country to put geothermal on the map, has utilized low-temperature geothermal hot water since the 1930s. At present, about 90% of their space heating is provided by a combination of high and low geothermal sources. In most cases, district heating systems, or networks, transfer heat through a network of pipes, rather than installing independent systems for every household. Other countries, including Japan, New Zealand, Hungary, and the United States also draw on the heating and cooling applications of Low-T. Presently, solar hot water and solar space heating provide cheaper systems for those considering renewable heating technologies without such a large installment cost. However, geothermal offers a more reliable and constant source of energy. Sunlight varies, while geothermal temperatures are always locked underground. In some cases, as in Canada's north where daylight hours are limited during the winter months, geothermal could present a better fit than solar. The geoexchange industry in Canada appears to be at the cusp of a massive growth cycle. About 30,000 residential homes and 6,000 commercial and institutional buildings are heated and cooled with geoexchange systems in Canada. At present, over 70 known ground source systems are installed or in construction in businesses in BC. Individual homes with geoexchange systems are estimated to exceed that number, though no data could be found. Development of low-temperature geothermal resources differs greatly from that of high-temperature geothermal resources, as they do not require tenure through the Geothermal Resources Act. As of 2011, the BC government was allotting tax-free grants for new geothermal heat pumps when homeowners upgraded their heating equipment in the amount of up to $1,250-$2,500 as part of the LiveSmartBC efficiency incentives program. Federal ecoEnergy grants are also available for the installation of geoexchange systems in the amount of up to $5,000 dollars. Despite this incentive, the remaining uncovered costs of ground source installation remain substantial — a certain barrier to the spread of this energy source. Heating costs can be reduced by 50 to 70% in winter, and cooling costs by 20 to 40% in summer. With the minimized heating and cooling bills, payback on the initial investment takes five to 12 years. The BC Sustainable Energy Association, suggests policy changes here to accelerate the use of geoexchange systems. Groundsource systems offer the security of fixed installation and constant operational costs. Unlike other energies whose costs fluctuate according to the laws of supply and demand, ground source heat remains very resilient against such changes. In a world where fuel prices are becoming more and more unpredictable, the value of ground source is gaining attention. To heat an average, 2,000 sq. ft. house with a geoexchange system would cost an installation fee of approximately $20,000 to $30,000 dollars. Additional costs may include modifications to the interior ductwork, water hookup and lawn restoration. Heating costs can be reduced by 50 to 70% in winter, and cooling costs by 20 to 40% in summer. With the minimized heating and cooling bills, payback on the initial investment takes five to 12 years. These statistics vary depending on location; colder regions may require larger, and more expensive, systems. With 70% of residential and commercial energy use focused on space and water heating, direct, Low-T geothermal offers the ability to compensate for all, or almost all, of that energy, minus the emissions. On a household, business or institutional level (many schools have converted to geothermal heating), Low-T can transform buildings on site from net energy consumers to energy producers. Pollution is minimized and the only consumables required are water (sometimes water and antifreeze) and electricity to operate the heat-pump. Geoexchange systems produce no emissions if used in conjunction with a green source of electricity to run the heat pump (e.g. solar). An important consideration is the use of water for geoexchange. For closed loop systems, this is often not an issue because the extracted water is reinjected (granted at a different temperature) and recycled continuously. Open loop systems are more intensely regulated because there is a net transport of water. Although geoexchange systems, even closed loop, are not directly interacting with the environment, they are changing the temperature of the ground. This concept is known as "thermal contamination" and may have effects on soil/ground dwelling organisms. This effect increases with magnitude of the temperature change and the volume of ground affected. In addition, care must be taken in properly sealing the boreholes and ground loops to prevent groundwater contamination. The results of a 2010 Canadian GeoExchange Coalition study demonstrate the advantages in greenhouse gas emissions when converting from conventional heating systems to geoexchange systems. They found that if as little as 2% of Canadian single-family homes installed geoexchange systems, a potential country-wide reduction in emissions of 376 000 tons of CO2 would be possible. That's the equivalent of taking nearly 112,000 cars off Canadian roads. Tomarov, G.V., and A.A. Shipkov. ‘The World Geothermal Congress WGC-2010.’ Thermal Engineering. Vol: 57 (2010) 989-992. Canadian GeoExchange Coalition. ‘Comparative analysis of greenhouse gas emissions of various residential heating systems in the Canadian provinces.’ (2010). Accessed May 30, 2012. http://www.geo-exchange.ca/en/UserAttachments/article63_GES_Final_EN.pdf. Salvador, Amos. ‘Energy: A historical perspective and 21st century forecast.’ American Association of Petroleum Geologists. Tulsa, Oklahoma (2005). Johnston, I.W., Narsilio, G.A., Colls, S. ‘Emerging Geothermal Energy Technologies.’ Journal of Civil Engineering, v. 15 (2011) 643-653. Low-T Geothermal's potential to generate power has seen heightened interest in recent years due to a political interest in reducing emissions and the consumption of non-renewable resources. Unlike high-temperature geothermal resources, which occur deeper underground and typically in areas of high tectonic activity, Low-T can be harnessed just about anywhere. High-Temperature Geothermal power uses water-based steam to drive turbines which then generate electricity. Low-temperature geothermal power production also powers turbines to the same end-result; however, it uses an intermediary fluid. Power generation from geothermal resources is usually accomplished through the use of a conventional steam turbine or a binary plant. Conventional steam turbines require fluids in excess of 150⁰C. This hot, highly pressurized fluid is then 'flashed' to produce steam, which drives the turbines to create electricity. The high temperatures required for this type of power production restrict it to use with high-temperature geothermal resources. Because water drawn from a Low-T geothermal resource is not at or near the boiling point of water, it is not possible to 'flash' these fluids to produce steam. Instead, the heat energy held within the water is transferred to a secondary fluid (thermal oil or silicone based oil), which has a much lower boiling point, and it is then this fluid which is 'flashed' to produce steam to drive a turbine. This process has been termed the Organic Rankine Cycle (ORC) and enables power production from fluids with a temperature as low as 75⁰C. This type of power production occurs in a binary power plant and enables electricity production from the more widely distributed and accessible Low-T resource. Low-temperature geothermal is still a new technology, compared to its sister resource High-T geothermal. Most power plants are moderate to high in the temperature category. Many companies have proposed development plans for Low-T areas, though few have actually begun drilling. It seems that most of the countries currently harnessing high-temperature geothermal (the U.S., Iceland, and the Philippines to name a few) are currently exploring Low-T resources as well. At the time of writing, Alaska was home to the world's lowest temperature geothermal plant to date. The Chena Hot Springs power plant uses fluid as cool as 75°C to generate electricity. Installed in 2006 by United Technologies Corp., the systems replaced expensive and polluting diesel generation systems. The Chena plant is often referenced in studies and company proposals, acting as the benchmark by which future Low-T geothermal power developments are measured. Canada produces no power through geothermal activities, either high-temperature or low. The country's highest potential site for geothermal is Mount Meager, an area 70 km northwest of Pemberton, BC, and within the Upper Lillooet Provincial Park. Mount Meager is classified as a high-temperature resource area, with maximum temperatures up to 275°C. $10 - 20 million in funding has been granted to the ADK/Borealis project. Through the use of Low-T thermal resources this project will provide enough electrical power for the community (~750 people) and enough heating capacity to serve the local greenhouse for food production. No other major low-temperature power plant sites have been announced for exploration or development in Canada that we know of. A central reason for this is the financial risk faced by developers. Companies must bid for land leases before they even know what kind of resources occur below the surface. Costly exploration may reveal unusable resources, resulting in a situation of money spent and nothing gained. Without governmental support to aid these companies, power from geothermal sources, either low or high, are unlikely to take off. It is uncommon for renewable energy markets to be able to grow and compete with conventional markets without the support of government funding and other incentives. For almost 25 years, geothermal science has not been funded by the Canadian Federal Government, states the Canadian Geothermal Association. This is a likely reason why Canada has fallen behind other countries around the Pacific Rim in geothermal energy development. Germany, the Philippines, and Mexico, among others, have implemented policies that encourage the use of geothermal resources. The BC Sustainable Energy Association lists several current policies (such as a 7 cent/kWh price guarantee for the first 5000 MW of geothermal power until 2015) as well as suggested policies to promote the use of geothermal energy in BC here. Low-temperature geothermal resources are more difficult to extract power from, as the highest temperature in the power generation cycle has a direct link to the overall efficiency. The Chena Power Plant in Alaska puts out electricity at 6 cents per kWh. The 2006 installment replaced the existing diesel generator, which produced power at 30 cents per kWh. The Geysers, a high-temperature geothermal power plant , sell power at 3-3.5 cents per kWh. Geothermal developers can share the infrastructure of oil and gas fields to generate electricity from otherwise wasted hot water. Possibly the most economical fashion to employ the use of Low-T resources is to "piggy-back" on the oil and gas industry. In the U.S, nearly 3,000 litres of hot water are produced from oil and gas wells. The hot water is largely seen as an inconvenience that requires expensive disposal. "Co-produced fluid" technologies eliminate waste while providing electricity to be used on-site, or sold to the grid. Collecting "waste" fluid, and passing it through an Organic Rankine System, can offer energy savings and diminished greenhouse gas emissions. 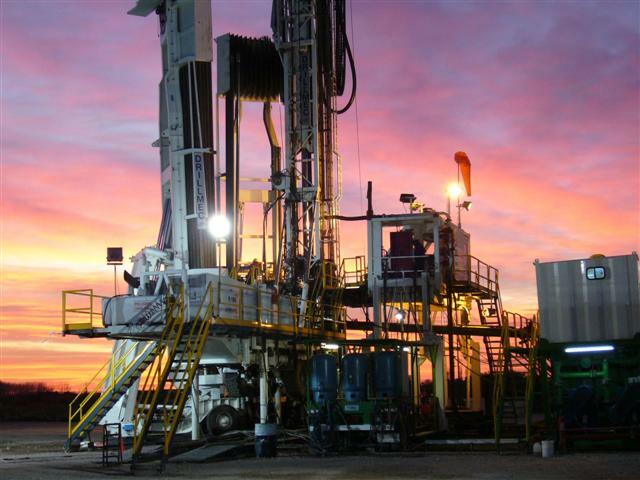 With the high up front costs of developing a geothermal power plant, sharing the existing infrastructure of oil and gas fields eliminates the need for hydraulic fracturing and drilling. In addition, there is potential to use the infrastructure from old oil and gas fields which are no longer in production to harness geothermal resources to produce electricity. The first successful generation of electricity from co-production (funded by the U.S. DOE) occurred in 2008 at the Rocky Mountain Oilfield Testing Center in the U.S. 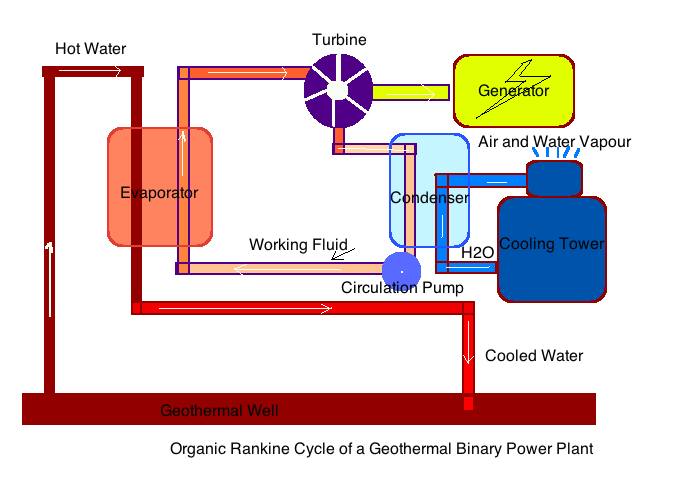 The binary geothermal power generation system used low-temperatures to generate 150-250 gross kilowatts of power. Low-temperature and high-temperature geothermal power plants swap fuel for either thermal oils or water-based steam, thus cutting back emission levels to only about 1% of the CO2 released by comparable fossil fuel plants. Likewise, only 1-3% of the sulphur compounds (which contribute to acid rain) produced and emitted by coal and oil-fired power plants, are released. The avoidance of emissions from transporting fuels to the plant further alleviates the CO2 emission levels. Land impacts are minimal; only a few acres are required for the plant's buildings. While geothermal wells and pipelines may extend over a considerable area, surface uses may carry on as before. Farming, wildlife grazing, and recreational activities have not been shown to suffer any negative effects from geothermal power plant operations. Of course, as with any human activity, some noise pollution and habitat displacement does occur, though it is markedly less than that of conventional energy production plants. Frick, S., Kaltschmitt, M., Schroder, G. ‘Life cycle assessment of geothermal binary power plants using enhanced low-temperature reservoirs.’ Energy, v. 35 (2010) 2281-2294. Hansen, T., 2008, Low-temperature Geothermal Technology Expands Clean Energy Reach. Electric Light and Power. Chena Geothermal Power Plant. Fact sheet. Retrieved from: http://www.yourownpower.com/Power/. Reinhardt, Tim. 2010. Low Temperature and Coproduced Resources Team Lead. Geothermal Technologies Program. U.S. Department of Energy. Retrieved at: http://www1.eere.energy.gov/geothermal/pdfs/webinar_20101118_aapg_low_temp.pdf. Clean Energy. 2011. Why Geoexchange? Residential Section. Retrieved at: http://www.cleanenergydevelopments.com/residential/why-geoexchange. Arellano, R., and M. Schriver. ‘Understanding geoexchange: heat pump technology.’ North American Clean Energy. Vol: July/August (2011). Accessed May 30, 2012. Axelsson, Gudni., Jonasson, Thorgils., Olafsson, Magnus., Egilson, Thorsteinn., Ragnarson, Arni. ‘Successful Utilization of Low-Temperature Geothermal Resources in Iceland for District Heating for 80 Years.’ (2010). Proceedings World Geothermal Congress 2010. BC Hydro- Regeneration. Geoexchange systems. Last modified April 19, 2012. Accessed May 30, 2012. BC Sustainable Energy Association, suggests policy changes here. Bertani, Ruggero. ‘Geothermal power generation in the world 2005-2010 update report.’ Proceedings World Geothermal Congress. Bali, Indonesia. International Geothermal Association. (2010). Accessed May 30, 2012. Blodgett, Leslie. ‘Taking a look at the low-temperature geothermal developments and prospects in Mexico, Canada, and the U.S.’ Geothermal Energy Association. (2010). Accessed May 30, 2012. Borealis Geopower. 'ADK/Borealis Geothermal Demonstration Project selected for Clean Energy Fund.' For NRCan Press Release. 2011. Accessed May 30, 2012. Canadian GeoExchange Coalition. 'Comparative analysis of greenhouse gas emissions of various residential heating systems in the Canadian provinces.' (2010). Accessed May 30, 2012. Canadian Geothermal Energy Association. ‘Geothermal Projects in Canada.’ (2011) Accessed May 30, 2012. Canadian Geothermal Energy Association (CanGEA). 'What is Geothermal?' 2012. Accessed May 30, 2012. Canmet. 'Renewables.' Natural Resources Canada. (2010). Accessed May 19, 2011. Chena Geothermal Power Plant. 'Fact sheet.' 2012. Accessed May 30, 2012. Clean Energy Association of British Columbia. 'Geothermal Fact sheet.' Accessed May 30, 2012. Crowe, Robert. 2011. 'Capturing waste heat with rankine cycle systems.' Renewable Energy World.com. Davis, A.P., Michaelides, E.E. ‘Geothermal Power Production from Abandoned oil wells.’ Energy, v.34 (2009) 866-872. Accessed May 30, 2012. Dickson, Mary and Mario Fanelli. 2004. ‘What is Geothermal Energy?’ Prepared February 2004 for the International Geothermal Association. Accessed May 30, 2012. Gunnlaugsson, Einar., Ragnarsson, Arni., Stefansson, Valgarour. ‘Geothermal Energy in Iceland.’ International Symposium in Izmir, Turkey (2001). Accessed May 30, 2012. Hansen, T. ‘Low-temperature Geothermal Technology Expands Clean Energy Reach.’ PennEnergy. (2008). Accessed May 30, 2012. The NEED Project. ‘Geothermal.’(2011) Accessed May 30, 2012. Oldmeadow, E., Marinova, D., Birks, D., Whittall, S., Brown, S. ‘Low Temperature Geothermal Applications as Enablers of Sustainable Development: Practical Case Studies from Australia and UK.’ Water Resource Management. Vol. 25 (2011) 3053-3071. Accessed May 30, 2012. Reinhardt, Tim. ‘Low Temperature and Coproduced Resources Team Lead.’ Geothermal Technologies Program. U.S. Department of Energy. (2010). Accessed May 30, 2012.